The new CAL is about to start (June 10th, whoohoo! ), and I am SO excited! Start by making a giant granny square. Everyone has their favourite ways of making one; I made mine with no chains in between the clusters and 1 chain in each corner. If you don’t know how to make a granny square, I recommend this tutorial. For my granny square, I changed colour every 2 rows. I picked the order of the colours at random. Make your granny square as large as you want; mine was 30 rows and about 50cms in width. When you’re finished, sew in the ends with your darning needle. If your granny square looks a little ‘warped’, it might be a good idea to block it into shape first. I did, and it made all the difference! Grab your fabric, and measure it against your square. Cut it a little bigger than your square to account for the seam allowance. Pin it to the back of your granny square (you want the fabric to cover the back of the stitches, because the right side will be the outside of your bag), with the edges folded under. Sew the fabric to your granny square by hand or using your sewing machine. If you were planning on sewing lace to your bag; now is the time! It’s easier sewing lace to your bag while it’s still square and flat :) I added 4 layers of lace, but you don’t have to go crazy like I did. Pin the lace to your bag and sew it on by hand or by using your sewing machine. I added lace to the front and back of the bag; meaning that I sewed lace to the top edge and bottom edge of my square, leaving the sides empty. We are all done with the sewing, yay! Now it’s time to turn this embellished square into an actual bag. From right to left, insert your hook into the first corner and work a single crochet stitch. Work the next one into the middle stitch of the first granny cluster. Work the next one in between this granny cluster and the next cluster. Go along the side like this until you reach the corner again, work 1 single crochet stitch in the corner space. Chain 1, and turn. Now work 1 single crochet into each stitch across. Chain 1, and turn. Work single crochet rows until you have 10 rows of single crochet stitches. Leave a long tail. Grab your darning needle and thread the long tail. Flip over the edge you just made, and sew the first row to the last row. Repeat this step for the opposite edge of your square. Grab your crochet hook and the dark brown yarn. We’re going to crochet the top and bottom edge of the square. From right to left, insert your hook into the first corner and work a single crochet stitch. Work the next one in between the next two granny clusters. Go along the side like this until you reach the corner again, work 1 single crochet stitch in the corner space. Chain 1, and turn. Now work 1 single crochet into each stitch across. Chain 1, and turn. Work single crochet rows until you have 10 rows of single crochet stitches. Leave a long tail. The bag is starting to gather a LOT now, and this is what we want! It’s what gives this bag it’s nice fat bottom. Grab your darning needle and thread the long tail. Grab one of the bag handles. Flip over the edge you just made, and sew the first row to the last row, around the bag handle. I created 10 of these puffy flowers, for which you can find the free pattern here. I modified the pattern a little bit by starting with 12 double crochet stitches instead of single crochet stitches. I sewed them to the front and back of my bag, with wooden buttons as the centers. I also tied some ribbons to the sides of the bag; and I strung some beads onto thin strips of ribbon and tied those to the front of the bag. Let me know what you think of this tutorial guys; I can’t wait to see your amazing bags! Today the mailman brought me something AH-mazing! :) I’m sure most of you have heard by now, but for those of you that haven’t: Scheepjes is coming with a new CAL this Summer: the Flight of Fancy CAL! It’s designed by Annelies, whom you all know from her blog Vicarno! She made a lovely shawl, and it’s made from Scheepjes’ new yarn, Linen Soft. 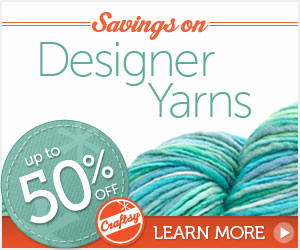 Hurray for yarn! :) I got my kit in the ‘Hummingbird’ colour way (there are three colour ways available – more info on that at the end of this post), and these are the colours – lovely jewel tones with a crisp, clean white as a base colour… I love it! The yarn is really amazing: it’s a linen/cotton/acrylic blend which gives it a nice sturdy feel, but yet remains soft to the touch. And the most amazing thing about this new yarn? It has an ‘Easy Start’ label that you can pull to get the center out! There are some lovely extra’s in this kit too, which, in my opinion, really set it apart from any other CAL out there. Let’s take a look! Alright, so here’s some info on the new CAL! Starts on: June 10th, kits available right now! Pattern: The pattern will be available from June 10th, on both the Scheepjes and Vicarno sites and in the Facebook groups! Facebook groups: There are 2 groups, a Dutch speaking one and an International one. Anyone can join! In my last post I told you what I was working on, and this is the finished product: a Parisian chique, fat bottom bag made with Scheepjes Softfun Denim yarn! I seriously had a LOT of fun making this bag. Right after I picked out the yarn and the colours, I knew which creative direction I had to take with this bag: Parisian chique! Think strutting along bistro’s, wearing your high high heels, a navy blue striped dress, a big hat of course… and this bag! The best part was searching for ways to embellish it. In the end, I settled on vintage lace (a LOT of it! ), some awesome crochet beads I had in my stash, and satin ribbons. I really went all out with the lace; I ended up sewing 4 different kinds of lace on top of each other! To top it off, I fully lined this bag with the perfect fabric I scored at a fabric market a few weeks ago. Alright, now for the best news: I will upload a tutorial for this bag next week on my blog, for FREE! :) This will include instructions on how to line your bag, how to add the lace, and how to make the puffy flowers. To make this bag you will need 6 skeins of Scheepjes Softfun Denim in the following colours: 501 (navy blue), 502 (grey), 507 (cream), 508 (light brown) and 510 (dark brown). I used two skeins of the 510 colour. Hope to see you all again next week for the tutorial :) Stay creative! Most of you guessed it right from my last blog post: I’m making another bag! :) And not just any bag, no: I’m making another fabulous fat bottom bag, Parisian style! Remember when I used to make fat bottom bags all the time? Well, my last one (which was made with gorgeous Noro yarn, still one of my favourites!) has been around the block a couple of times, and I though it was time for a new perspective, a new look. When Scheepjes came out with their Soft Fun Denim yarn, I knew I had found *just* the right yarn for my new bag! This bag is really easy to make, because it’s basically one big granny square!